Army Corps and NYSDEC presented their plan for the future of the Barrier Island beaches, including storm resiliency and hardening initiatives. Over 200 residents turned out for the event to voice their concerns over how the project will impact the beaches and roads. Long Beach, NY - June 30, 2016 - Senator Todd Kaminsky, along with the Office of Rep. Kathleen Rice, Nassau County Legislator Denise Ford, and the City of Long Beach hosted an informational forum last night, where the U.S. Army Corps of Engineers (Army Corps) and NYS Department of Environmental Conservation (NYSDEC) presented their plan for the future of the Barrier Island beaches, including storm resiliency and hardening initiatives. On Tuesday evening, Senator Kaminsky partnered with the Point Lookout Civic Association to host the Army Corps and NYSDEC for a similar presentation. Over 200 residents turned out for the event to voice their concerns over how the project will impact the beaches and roads. 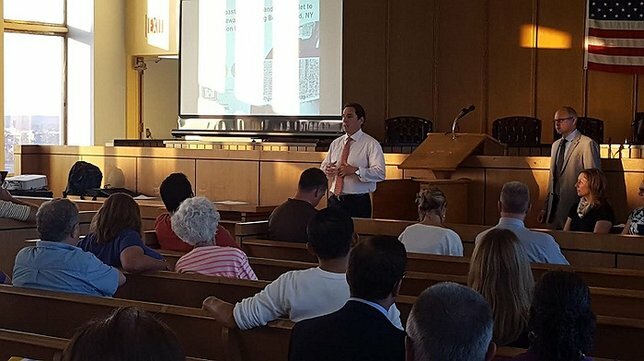 Subject: LongIsland.com - Your Name sent you Article details of "Kaminsky, Local Officials Host Forum with Army Corps of Engineers and NYSDEC about Future of Our Beaches"